It’s Comfortable, It’s Sanitary, It’s Affordable, and It’s The Law. 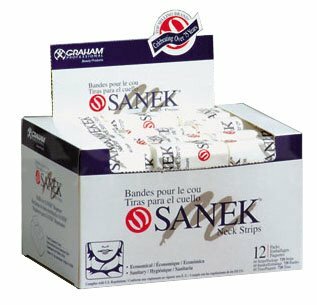 Made of a soft, highly absorbent, wet strength tissue, SANEK® Neck Strips catch loose hair, absorb perspiration and drips. They stretch to fit around the customer’s neck, keeping it clean and comfortable. In most states, neck protection is required to prevent soiled hair-cutting capes from touching the customer’s skin. SANEK® cost a little over a penny a piece versus paper towels at 5 cents and a cloth towel at 10 cents.